We are very grateful that GamersGate sent us this game to review! Amanita Design has made several short Flash games before, but Machinarium is their first full length adventure. In Machiniarium, you play as a robot who was captured and dumped for trash, in several pieces. Unfortunately, a gang of bad robots took your girlfriend and have locked her up. After putting yourself back together, you take it upon yourself to free her, even though you have to face the whole gang by yourself. Machinarium is an adventure game in the style of classic games like King\'s Quest, Maniac Mansion, the Monkey Island series, and others in the genre. In this games, you see your character on the screen, and interact with your environment by gathering items, solving puzzles, and encouraging player ingenuity to get past obstacles. 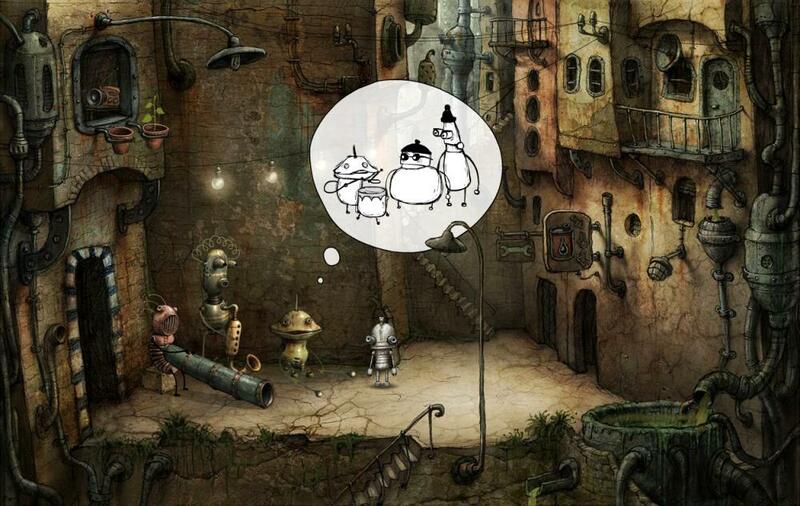 Despite much similarity to past adventure games, there are a few things that make Machinarium stand out. First is the completely hand drawn graphics and animation. This is immediately obvious after a first look. The dystopian world of garbage, dirt, flies, and goop, is also teeming with hints of mechanical life with little mechanized rats, flies, and various semi-humanoid robots. There are also drops of oil, streaks of rust, and other environmental factors that show this world has been all mechanized for a long time now. There are also hints of what once was with fits of grass, weeds, trees, and other vegetation as well as various pieces of old appliances around to litter the environment with color, mood, and style. Some of the characters also seem to be made at least in part with some of these old appliances. In equal parts to the graphics is the impressiveness of the sound effects and music. As you would hope in a dystopian world teeming with mechanical life, there are a lot of industrial sounds, and nothing was left out. Almost everything that moves, from the little cleaning bot scrubbing with brushes to an older robot\'s wheelchair to the sounds of footfalls and light bulbs flickering in the background, it\'s all represented here with amazing depth. There is also appropriately ambient sounds and music to represent each frame in a way that makes sense and sets the desired mood. There is one section where I found myself turning up the music; at least one of the tunes is good enough that I would consider buying the CD, and it is available for purchase. There are also five free bonus tracks you can download (takes a bit of searching to find, but they are legal), and the game directory \'11\' has all of the game sounds as mp3 files, renamed as quirky binary filenames. The excellent sound and artwork leads to the next area of uniqueness with Machinarium: the storytelling. Machinarium is really unique in that this is one story told entirely through graphics and sound – with not one spoken word, or one written letter (there are a few numbers, some using roman numerals, though). The only words in the game are game menu items (save, load, etc.) on the bottom of the screen, and of course the title screen. The demo has a few extra words to help you see how to interact with the game. As a result, it uses emotive gestures and sound effects as well as thought bubbles to tell the story. The thought bubbles are really well done with outline-style drawings that really draw you in. I found it a very effective storytelling method that made me smile a few times. These thought bubbles are used for everything from exchanges between people, to remembering the trauma of your character\'s girlfriend being stolen. For example, when you want to cross a bridge early on in the adventure, a thought bubble appears with a picture describing what you want done: the bridge lowered. Another early flashback shows you and your girlfriend playing paintball together, with you leaving holding hands. It becomes obvious that you care for each other a whole lot, without one word spoken, only laughter shared. Like many classic adventure games, Machinarium has puzzles that definitely make you think. There is everything from the classic sliding puzzle, or other board game style puzzles, to the interactive \'use this item with another\' type. Later on, the puzzles get wickedly tough. Another source for challenge is that unlike many adventure games, you cannot activate an item unless you are standing next to it. So you can\'t just click randomly to find things. If that wasn\'t enough, your character can crouch or stretch to be able to reach higher up places or items, and in many cases the necessary item or action will not be triggered unless you are in that state. Also, useable items are not obnoxiously obvious – sometimes you have to poke around a bit with your mouse to find what you are looking for. In case the goal for a screen is not clear, there is a simple hint button that shows you generally what the goal is. If that is not enough, there is a built in walkthrough that has to be unlocked by completing a simple shoot \'em up mini game. This walkthrough was drawn by the original artists, and is fairly complete, so even the trickier puzzle solutions are there and easy to access. Avoid using this at all costs though – it certainly takes some of the fun out of the game! I did find myself using it a handful of times though. Overall, I found this game fairly bug free, with one exception and a few quirks. On one puzzle which I couldn\'t figure out required wiggling a wire to the breaking point. I wiggled and wiggled with no luck. One FAQ recommended setting the graphics to the lower resolution, which did indeed allow that wire to break. It was strange, but the workaround did the job. Other than that, no bugs to speak of. The game supports windowed mode, and full screen, but it is only playable in one of two resolutions: 1000x632, and 1250x790. This works great for moderately sized screens, but my 1920x1200 pixel screen has substantial black bars around the sides, and most netbooks couldn\'t play this game at all, which is a pity. I have little doubt that this is simply a Flash limitation; it probably can\'t scale 2D graphics of this type. The whole game is simply a Flash game wrapped in the Flash player. As such, it was very easy to port to Mac OS X and Linux. I haven\'t tries those other environments (GamersGate doesn\'t include the Linux port) but I have little doubt they\'d work fine. This game, with all of the beautiful art and sounds, is also fairly clean for appropriateness, though with a few small notable exceptions. There are two sections which show smoking in a positive light, with one being in a flashback where the main character is hiding what they are doing from the police. Also, if you click on a toilet, your character will sit down, strain a bit, and resume what he was doing. There is a small amount of what the ESRB calls \'comic mischief\', people getting hit by objects and such things, though it\'s not a regular occurrence. While these issues are worth noting, it\'s a pretty clean game. 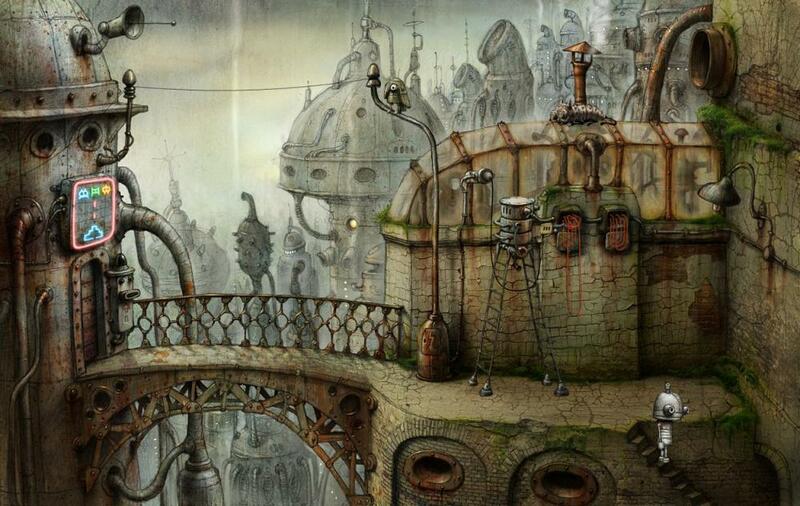 Machinarium is a game that all fans of classic adventure games should really look into. It\'s fun, though a bit short, and is fairly clean, though parents should be warned about the smoking and hiding part, and the \'toilet\' humor. Nevertheless, it\'s a game that, despite it\'s small shortcomings, and an experience worth taking, especially for adventure game lovers. This is the first adventure game I have played and enjoyed in a very long time, and I really enjoyed it because of the well done art, music, and creativity.